Founded in 2018 for the 2019 tournament season, the Palmetto Kingfish Tour is a limited-entry tournament series that can pay upwards of $375,000 in prize money for 2019. The “Tour” is supported by four proven tournaments, The Lowcountry Open – Nearshore Division, Hooked on Miracles KMT, James Island Yacht Club KMT, and Marlin Quay King Mackerel Shootout. 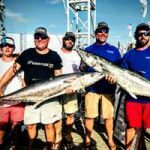 Teams throughout the country entering the Tour must compete in two of the qualifying tournaments to be Tour participants, and the top qualifying teams will compete in the finale, the Palmetto Kingfish Tour Championship.